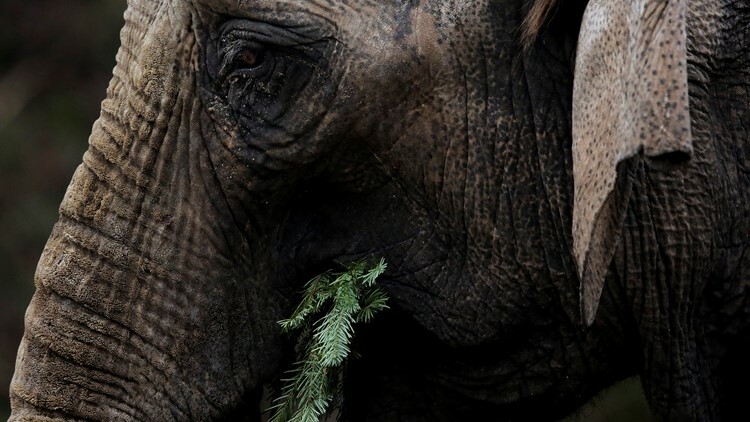 An elephant with a Christmas tree at Tierpark zoo in Berlin, Friday, Jan. 4, 2019. Video footage shows the man washing the elephant with a hose moments before the incident. A man was crushed to death by an elephant in India after he whipped the massive animal with a stick. Video footage published by several media outlets shows Arun Panikkar was washing the elephant with a hose moments before the incident. The elephant was apparently under Panikkar’s care. Mirror UK reports Panikkar hit the elephant with a stick in an apparent attempt to get it to sit down. But, Fox News reports he appears to have whipped the animal so hard that he lost his balance and slipped in the bath water. At that point, the elephant plops down right on top of him. The footage shows another man running over after seeing Panikkar on the ground below the elephant. The man attempts to move the elephant with no luck. Eventually, the man uses a stick to get the elephant to stand up before pulling Panikkar out from underneath. Click here to view the blurred footage, which is disturbing. Viewer discretion is advised. Note: The elephant shown in the picture above is a file photo. It is not the same animal as the elephant from the incident in India.